Hi Maria Teresa, first thing’s first: can you explain your research for our supporters? My research focuses on Mixed Lineage Leukaemia, an aggressive form of leukaemia mostly affecting children. The current treatment is based on chemotherapy followed by bone marrow transplantation; however, it isn’t very effective and even patients who respond eventually relapse, which means that the disease will come back. We believe that this happens because some leukaemic cells hide, escape the treatment or simply survive the treatment. So, we need to understand how this happens to be able to kill the leukaemic stem cells. That sounds like great work. How do you think will it affect or impact leukaemia patients in the future? 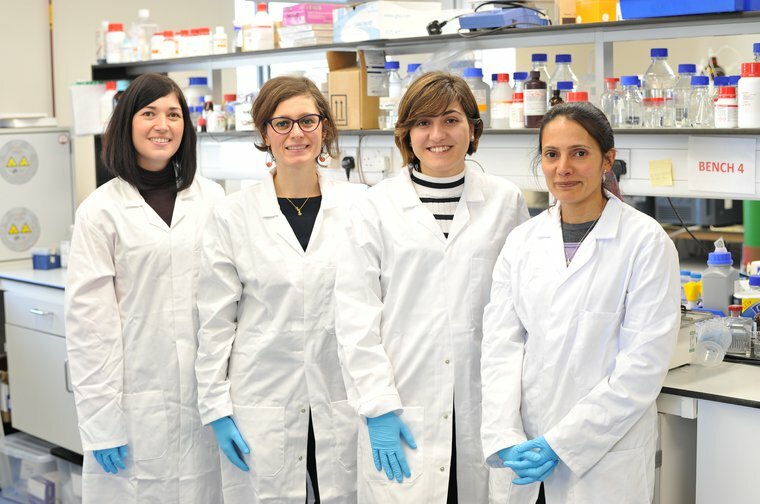 I hope that my research will allow us not only to increase our knowledge on the biology of leukaemia but also to help us to design new treatments and spare families from the suffering of living with this disease. I am a biotechnologist so I do not see patients, but I believe it is instrumental to collaborate with clinicians and to remind myself that there are people dying from this disease and why the research needs to continue. What inspired you to research this particular type of leukaemia? I did my PhD in gene and stem cell therapy working on a population of stem cells widely used in regenerative medicine protocols. Working on this project I started to develop an interest in the mechanisms that transform a healthy stem cell into a cancer stem cell and decided to re-train in this field. I joined the lab of Professor Eric So at King’s College London as a post-doc, where I had the opportunity to work on leukaemic stem cells in particular. My research at King’s led me to identify a new therapeutic approach for patients affected by other leukaemias. Unfortunately, the treatment would not work on Mixed Lineage Leukaemia. It made me think that we must study this disease in greater detail because this cancer is so unique. It is fantastic that Leuka can support your research with the John Goldman Fellowship. How has the Leuka grant helped you? Is there anything you’re doing that you couldn’t have done without it? Leuka support has been instrumental for starting my independent research programme. This is one of the most crucial and challenging stages in the career of a scientist. I had a research plan but no funding to pursue it. There is no other programme that invests in brilliant new ideas the way the John Goldman Fellowship scheme does. The grant gave me the funding necessary to hire a post-doctoral researcher and is helping us to realise my ideas. On top of this my institution, the University of Roehampton, match-funded the Leuka grant, meaning I also have a post-doctoral researcher and a PhD student that share with me the ambition of finding a new treatment for Mixed Lineage Leukaemia. It all sounds very positive. What do you hope to do after the fellowship? I hope to carry on the legacy of John Goldman and to contribute scientific advances into clinical practice one day. The Leuka funding will act as a catalyser and will help me generate the data necessary for applying for further funding and for attracting new collaborators and investors to extend this research to further help patients with MLL. And I would like to thank with all my heart Leuka supporters for funding our research. Research is slow and challenging but it is the only way towards a world where this disease will be curable – thank you!